Accompanied by Senator Juan Carlos Romero Hicks of Guanajuato, Mayor Kiko Munro paid a working visit to Arizona to promote Puerto Peñasco as a safe destination for tourism and investment. Municipal Economic Development Coordinator Jorge Valdez Félix joined Mayor Munro and Senator Romero Hicks as they first visited Peoria High School, where they made a presentation to 300 graduates and then held a valuable question and answer session with outstanding students. The agenda also included a meeting with Arizona Senator Jeff Flake, together with ASU University Affairs Advisor Rafael Rangel Sostmann, and Global Chamber Executive Director Doug Bruhnke, during which the mayor highlighted several strategic projects to help advance the municipality’s economic revival. 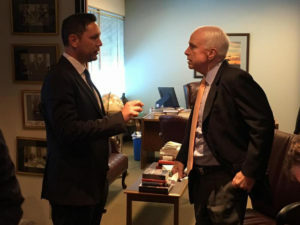 Mayor Munro and Senator Romero Hicks also met with Arizona Senator John McCain, who spoke of the need for the United States to strengthen ties with its neighbors of Mexico and Canada, which has been his main goal as a politician. For his part, Mayor Munro reiterated his administration’s commitment to maintain the destination as one of the safest in Mexico not just for visitors, but also for investment. The mayor also made history at the Arizona House of Representatives, as no other global official who is not an Arizona legislator had participated in addressing a bicameral session of the Arizona legislature. Mayor Munro discussed the relationship between Sonora and Arizona, and particularly of the union that has always existed between residents of Puerto Peñasco and Phoenix, reiterating the city will always welcome them with open arms. Finally, the country’s two main Hispanic television channels interviewed Mayor Kiko Munro, who invited viewers to visit Puerto Peñasco.